It may not be the option that immediately jumps to most people’s minds, but cork flooring is a time tested option that has many great benefits. It’s cost effective, very functional and eco-friendly as well as being quite attractive. For those looking at the best cork flooring options, here are some tips and ideas about the benefits of cork flooring, to make your cork flooring installation project a smoother and easier process. Cork comes from the bark of trees that grow in Portugal and Spain. It is a renewable resource, so has great eco-friendly appeal. Harvesting cork doesn’t harm the trees, which are peeled, but not cut down, in the process. Cork trees can yield a new harvest about every decade. However, despite being renewable, the once a decade harvest still puts it in limited supply. 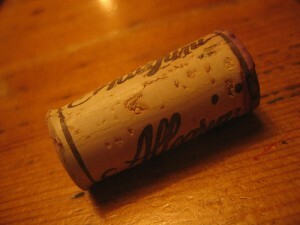 Consequently, cork flooring companies are recycling old cork wine stoppers to produce flooring. Cork has rich and handsome color tones that resemble traditional hardwood, but maintain a softer, warmer feel. There are a variety of options for material buying and working: large sheets, tiles, plank-style, or as a composite, cork can be cool and subtle, or dramatic. It will give an appealing marbled look that is in fact sometimes mistaken for marble. Another great benefit of cork is that it can be stained the color of your choice. As with wood, the natural beauty and texture is enhanced and protected with a water-based polyurethane. Since it is softer than most other floor surfaces, cork is great for the kitchen. You’ll find it far more forgiving, on those occasions when glasses or plates slip from the hand, than can be hoped for if dropped on ceramic tile. Also, the usually greater amount of time spent standing in the kitchen provides another benefit, since it has more give and as a consequence is easier on feet, legs and backs. The same gentle give makes it as well great for young child to play on – something that apparently happens in some kitchens. Another great advantage of the softness of cork is that it absorbs sound more than hardwood, tile or linoleum. People often fear that cork flooring will be too fragile, but this turns out to not be the case. For instance, what about dropping a sharp knife in the kitchen; won’t that permanently damage the floor? The unique cellular structure of cork flooring though creates natural air pockets that give it a “self-healing” property when pierced by sharp objects. Plus, a real benefit that many people don’t expect, cork contains “suberin,” a naturally occurring chemical that protects it from mold, rot and insects. You can see the benefit of that to the tree and why it makes so much sense then to use cork to store wine for long periods, but it’s also a benefit to your flooring, in the kitchen and elsewhere. 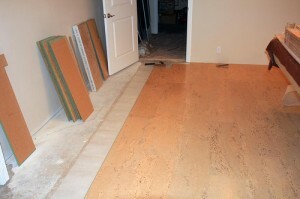 It is possible for cork flooring to be damaged. Dragging heavy furniture or appliances across it is not advised. Also, you’ll need to ensure proper padding for heavy items like sofas to avoid leaving indentations. However, with some care, your cork floor can last 30 years. There’s variance in types and qualities of cork available for flooring. You could pay between $1.50 per square foot and $4.50. It may not be the least expensive flooring you can buy, but it’s far from the priciest, and once you factor in the life span and resilience, this is an option well worth considering. So, for those looking at the best cork flooring options, hope these tips and ideas about the benefits of cork flooring help to make your cork flooring installation project a smoother and easier process.